To create a unique ice cream package design. So, it's poison ice cream, because who's going to make poison ice cream? No one (I hope). Coming up with flavor names was a really fun exercise, as you can imagine. I landed on Hemlock Honeycomb because I felt that it had the strongest thematic potential, so I ended up taking that idea to completion. I spent a good amount of time Googling plant-based poisons and researching their effects, so the NSA is probably watching me. I love creating my own typefaces. I always begin by looking for typefaces that already exist to sketch and play around with in my sketchbook. I'm not a fan of going straight to the computer for...well...anything really. Drawing allows me to make decisions quicker, giving me a better idea of where I want to go. Looking at the sketches it's interesting to see how every page contains some element that ended up in the final design. The ice cream cone/nightshade/skull combo idea was sort of there from the beginning as you can see from the logotype sketches. I refined it as I played around in Illustrator, but the look was influenced by researching apothecary labels. The pattern was the biggest time commitment here, by far. Ice cream is often marketed with a colorful and fun aesthetic, and I wanted that to carry over to Belladonna's to give it an unexpected twist. This was a chance to incorporate something else I like: medical illustrations. 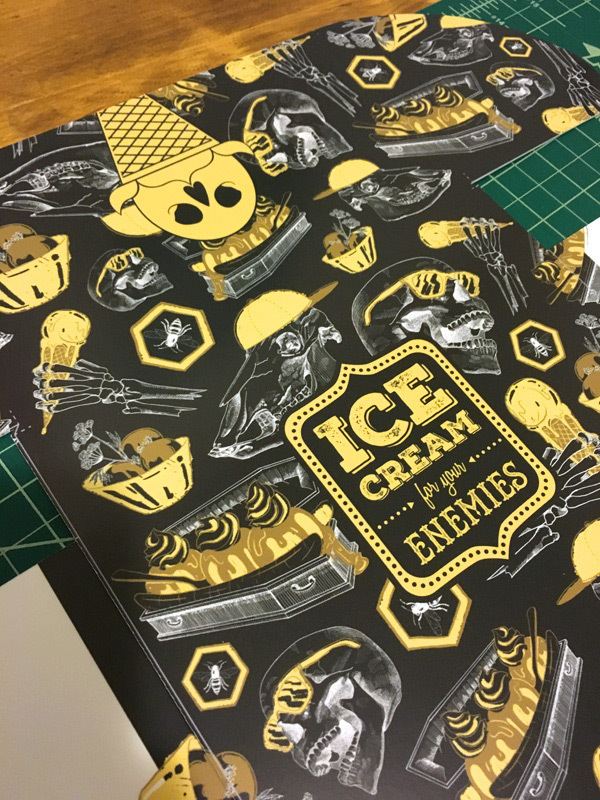 That old school cross-hatching style has always had a bit of sinister appeal to me, so I mixed that with a relaxed and light-hearted illustration style more at home on modern ice cream brand packaging. It's saying "you're going to die, but in the most pleasurable way possible." After doing the drawings, scanning them into Photoshop and adding the more colorful elements, I popped them into Illustrator and started messing around with the layout. The pattern took some time to figure out but after some experimenting I found a happy medium of size/scale. And then for the inside of the box I converted them to look like negatives of the originals. What follows are the process pics of the printed packaging as I'm cutting it out for a real-life mock up.